The holiday season is here! That means spending cozy days and nights around the fireplace with family and friends. For this very reason, it’s important to make sure your mantel is ready to dazzle. As a Breckenridge realtor, I have the benefit of viewing lots of different mantel styles. so today I want to spend a little time talking about some ideas you can use to showcase a mantel that reflects your tastes. One of the best ways you can make your mantel shine is to decorate with contrasting shapes. For example, consider placing a tall picture frame next to a slender vase or a blocky candle. These varying shapes will create intriguing focus points that will draw your guests right to your fireplace. You can change and rearrange your decorative items as you wish to alter the effect. Sometimes a mantel calls for symmetrical designs. If that’s your style, consider placing one dominant item in the center with smaller objects on each side. A good example is hanging a mirror in the middle and then placing lamps or small statues along both sides. You could add another pair of smaller items to the mix in the form of vases, candles or other objects that make your display even lovelier. A finishing touch could be a pair of matching armchairs in front. Then you really have an intimate, elegant corner in your home. If you really don’t want to risk any clutter, you may consider placing a favorite piece of artwork at the center of your mantel. That way, all eyes will be drawn to the painting. To subtly accessorize, you might decide to put a small plant on one end or some small, glass items on the other. They will serve as accents for your highlighted artwork. The best part about mantels is that they can be transformed to suit your style without a lot of work. Choose special objects that matter to you for this prominent shelf. They will set the tone for your home’s unique feel and provide a welcome area to celebrate your hospitality. As you can tell, there’s no shortage of ideas for making your mantel a fantastic place to display your personal style. Hopefully, you’ll get inspired by some of my suggestions in this blog. However, don’t stop there! 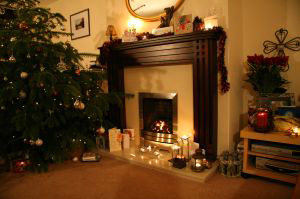 Be creative and make the mantel reflect you in every way. On a related note, if you’re thinking of looking for a new home in Breckenridge or Summit County in the coming year, feel free to reach out. I can put together some properties that might suit your tastes. You can start by looking through the updated listings on my website and when you’re ready to discuss your options or prepare for showings, contact me at any time via email ([email protected]) or on my office line. I look forward to working with you!